With easy access via online storefronts and similar sources, terrorists and rebels and even government forces from Iraq and Syria to Ukraine’s breakaway Donbass region have been increasingly using small drones. With little training, insurgents can use these tiny flying machines to spy on their opponents, direct artillery strikes or even possible attack targets directly. The Pentagon describes the first category as remote control aircraft generally weighing fewer than 20 pounds that routinely fly below 1,200 feet. The next level up are craft up to 55 pounds that can travel up to 3,500 feet in the air. Troops shouldn’t expect drones in either group to fly faster than 300 miles per hour. The Army generally uses the smallest group to describe drones such as the hand-launched Raven. American soldiers use these small aircraft to scout ahead and look for possible ambushes or other hazards. However, the category covers an ever increasing number of commercial types already available to hobbyists and private citizens. The most common variants are miniature helicopters with four, six or even eight separate rotors, which can cost anywhere between around $100 and $500 depending on the particular configuration. The manual says these drones present four basic types of threats, from spying to indirect and direct attacks to swarming friendly troops. The possibility of enemy fighters snooping on American positions is a very real concern. By 2014 in Syria, both rebels and militias loyal to Pres. Bashar Al Assad were flying relatively cheap quad- and hexacopters to snoop on each other. The same year, Ukrainian troops strapped cameras to a number of quadcopters and remote control planes to try and find Russian-backed rebels in the country’s restive eastern regions. 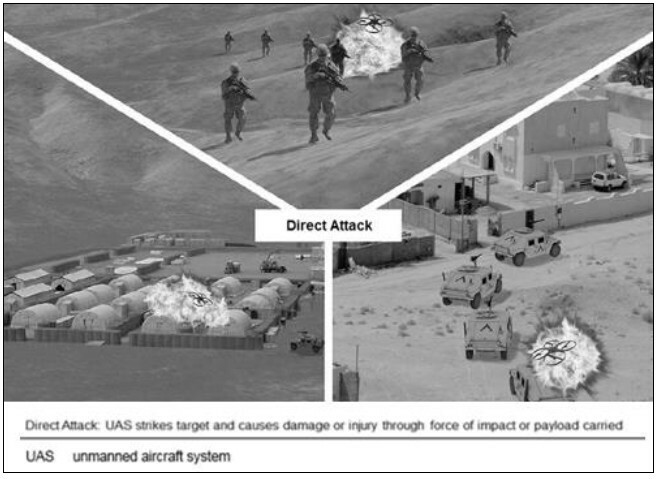 On top of traditional surveillance, the Army air defense manual points out that enemy fighters could use the drones to watch troops approach a roadside bomb or other hazard. With the remote controlled camera overhead, they could set off these improvised explosives at the best possible moment without having to be nearby. Islamic State terrorists have also recorded suicide bomb attacks with drones for propaganda purposes. But the Army is worried that militants could turn these amateur flying spooks into remote controlled bombs, too. In June, a spokesman for the Pentagon’s Joint Improvised-Threat Defeat Agency told Bloomberg that Islamic State had already done just that in Iraq. On Aug. 9, Iranian-supported Lebanese Hezbollah militants fighting on behalf of Assad’s regime in Syria posted a video online — seen above — showing what appeared to be a quadcopter dropping bomblets on rebels in the besieged city of Aleppo. While hobby drones can’t carry much, they could potentially lug a small amount of explosive or toxic chemicals very close to their target. The pilotless craft might then either drop the deadly payload or simply smash into its intended victims. 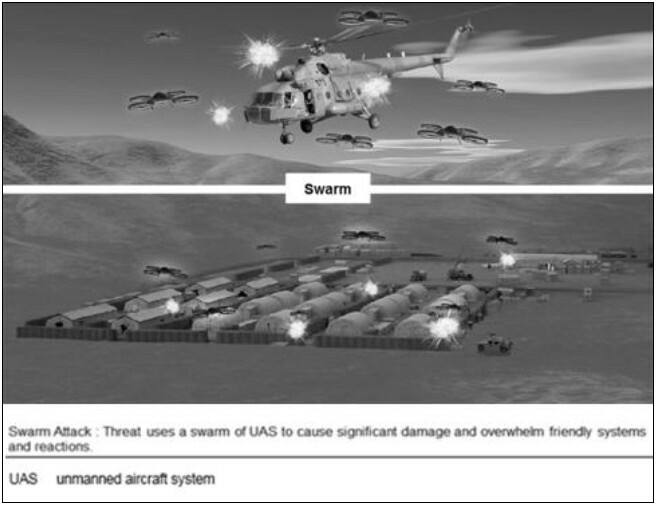 Perhaps most worrying is the potential of a “swarm attack” involving multiple pilotless craft. A group of drones could easily confuse, distract or otherwise endanger American troops. A small quadcopter or similar type could harass and endanger larger helicopters or other warplanes just by getting too close. Smacking a $500 drone into the rotors of chopper or the engine of a multi-million dollar fighter bomber as it takes off or lands would be a worthwhile trade for insurgents. In 2015 in Syria, Islamic State reportedly released small explosives tied to balloons — possibly condoms — filled with helium in hopes of bringing down gunships. If a quadcopter appears overhead, the Army’s manual tells troops to try and get away from it, seek cover and decide whether to try and shoot it down. The soldiers should warn their commanders and any other nearby units. Since at least 2015, the Army has been looking at ways to deal with these new threats. The kinetic option the manual describes include new anti-aircraft guns and laser weapons. Private companies are offering net-launchers and jammers. In July, Peter W. Singer, author of Ghost Fleet, tweeted out a picture an American soldier had sent him of an “anti-drone rifle” at a base in Iraq. For those troops, the Army’s new manual is just a confirmation of what they already know — America’s drone monopoly is over.